The mess of last week has turned into 5o fresh new batts! 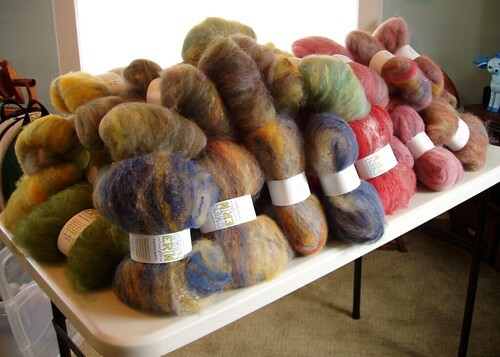 I’ve got a wider range of colors in this batch in addition to funky fibers like angora, silk noils, and mohair. Also, I reworked the packaging for the new year. The ribbons and tags were just too much hassle. Cut out the tag, round the corners, punch two holes, cut ribbon, thread ribbon, tie ribbon around batt. Then you’ve got all those loops to get fingers stuck in — ugh! Time for something a little quicker and cleaner! I ended up going back to wrap labels, just like the yarn and fiber. I prefer to think of it as consistency rather than monotony. Consistency in branding is a good thing. Those batts look positively luscious. Oh, thank you! I think it will help the overall look of the booth to have a consistent packaging style. So far I don’t have these available online because I tend to sell them in a “mix-n-match” format and I’m not sure that would work so well via Etsy. But if you are interested in getting some, we can talk! Yes, the batts look great. 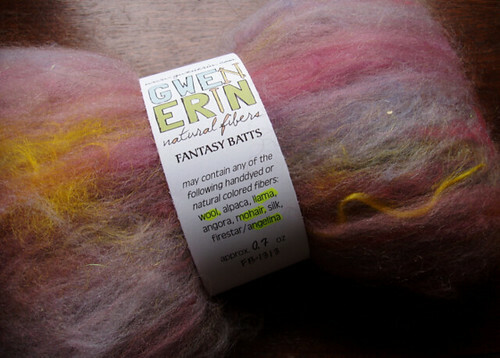 I’ve been selling batts at my lys and I find it tricky to pick packaging. Hard to balance between protecting them from getting messed up (with plastic bags or something) and making sure customers can feel the fibre. Do you find your batts get man-handled at shows? Am I just being paranoid? I’d love to hear your opinion/experience about this!